It’s been nearly a year in the making, but we are proud to announce the launch of two highly anticipated woodworking plans! As you can see below, the cigar humidor box and tabletop liquor cabinet look great together as companion pieces, but each can also be the star of the show on its own. Our models were built of Alder wood, but you will be able to select the wood species you prefer to work with. The cigar humidor woodworking plan details the lining of the case and lid with ¼-inch thickness Spanish Cedar wood. You’ll love that the cigar humidor box is sized to hold 75 cigars! The hygrometer component on the outside of the box will indicate the optimum humidity to help keep your cigars fresh. We hope you’ll also enjoy the clever design of the Tabletop Liquor Cabinet, with its lockable cabinet and lazy susan turntable. Inside, you’ll be able to store 5-6 standard size liquor bottles or a few bottles with glasses and accessories – you decide! I truly enjoyed designing these new woodworking plan products, and I am confident our Klockit customers are going to enjoy building them as well. 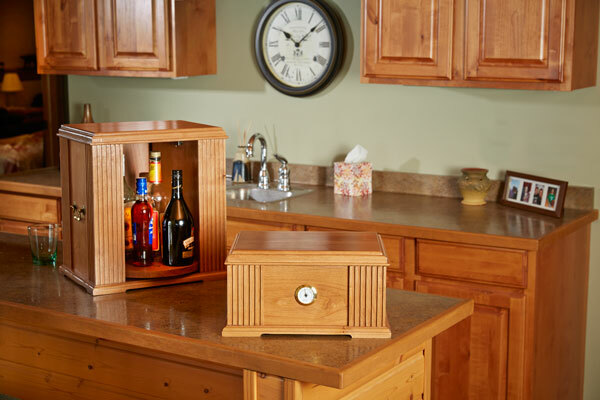 Both the cigar humidor case and tabletop liquor cabinet make for very special gifts to family or friends. Click to view the details of the Cigar Humidor Box woodworking plan and Tabletop Liquor Cabinet woodworking plan.